Stylish and casual. The new elevator sneakers "Tarifa", handmade in Italy, are characterized by the freshness given by their soft and breathable leather. 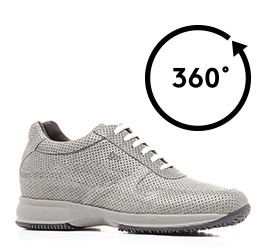 The perforated upper in full grain leather and the inner lining in soft goatskin leather, allow the foot to breathe. The insole in genuine Italian leather and the latest generation outsole lightweight rubber anti slip are handmade to give maximum comfort. The internal increaser can be chosen between 6 cm,7 cm, 8 cm or 10 cm. A total look all made in Italy that combines an immediate increase of both height and self-esteem.